LOOKING FOR AN EXCITING TENNIS TABLE GAME WITH FAMILY AND FRIENDS? ✓ VERY COMPLETE SET: Includes Four ping pong racquets (colors red and black), Eight 3-STAR (Competition Level) table tennis balls (colors white and orange) and Storage case. For singles or doubles play. ✓ YOU DESERVE PREMIUM QUALITY RACKETS: The 5-Ply blades and inverted 1.8mm soft sponge rubber provide better control and performance for any all-rounder loops, defensive, and offensive shots. The comfortable grip helps with the forehand strokes and different looping styles. ✓ HIGH QUALITY BALLS IS A MAIN FACTOR ON TABLE TENNIS GAME PERFORMANCE: Includes eight 3-star rated balls specially designed for better serves and smashes. Three star rating is the highest quality available; more resistant and accepted by the ITTF (International Table Tennis Federation). Environmental friendly ABS material. ✓ YOU NEED STORAGE! NO MORE MISSING ACCESSORIES: Our complete set comes with a Storage Case, perfect for traveling and to protect all your ping pong accessories. The attractive case design makes it the PERFECT GIFT SET. ✓ IDEAL FOR SHARING WITH FAMILY AND FRIENDS: For all ages and genders. Table Tennis is a GREAT GAME FOR KIDS. It stimulates early social bonding, physical development and enhances motor functions, fine motor skills, and strategy. The paddles have a weight-balanced design with a flared grip that makes them appropriate for small hands. ✓ CUSTOMER FIRST: We offer a 60-day warranty on Manufacturer defects. Contact us directly and let us know if you have any issues with the product so we can make things right for you. 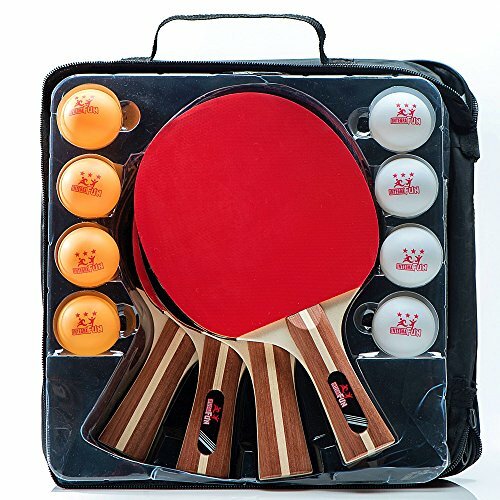 ✅ CUTTING EDGE TECHNOLOGY: While other ping pong paddles are made of thin sponge, have peeling faces, or come with unrated balls that will dent after a few uses, the Integrafun 4-player table tennis paddle set has a unique technology design with thick 1.8mm soft sponge, odorless strong glue on eco-friendly pads and 3-star rated more resistant balls. A storage bag will help you maintain order and make travel easy. All this means an improved experience in your ping pong game. ✅ PREMIER QUALITY: Four custom designed ping pong rackets with 5-ply poplar wood blades for more stability. An inverted layer of 1.8mm soft sponge and eco-friendly high performance red and black pads provide better ball control, spin and speed. The comfortable ergonomic grip design with flared wood handle, wider towards the bottom, makes this table tennis racquets also suitable for kids table tennis play. ✅ HIGH PERFORMANCE BALLS: Eight 3-star rated 40mm ping pong balls (ITTF approved for Professional Competition) provide an optimum bounce for better stroke control. Made with eco-friendly ABS (Acrylonitrile butadiene styrene) for improved roundness and durability that will last longer than other brands in the market. ✅ PORTABLE COVER CASE: We help you save time, protect and organize your ping pong accessories with the ping pong paddle case. Easy storage and convenient travel indoor/outdoor. Integrafun Table Tennis Set with its handy storage bag is the perfect gift for anyone!! ✅SATISFACTION GUARANTEE 60-day warranty on manufacturer defects. We use our own products everyday and are committed to providing you with high quality products that you can enjoy with your family as we do with ours. Please contact us directly if you have any concerns about your product. Finally a high quality and durable ping pong set without compromising your pocket! Integrate your family and friends with INTEGRAFUN 4-PLAYER PING PONG PADDLE SET. If you have any questions about this product by IntegraFun, contact us by completing and submitting the form below. If you are looking for a specif part number, please include it with your message.